There has always been a fascination with double engined motorcycles for me since I was a nipper, as i remember seeing Russ Collins Sorcerer, and thought how cool would that be to ride. 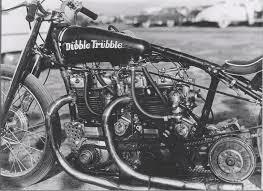 Below is an infamous motorcycle that was simply amazing to see in the 50’s and even today. And getting 142 MPH back then was a feat on its own, so sit back and scroll down and enjoy this unique machine, I sure did. 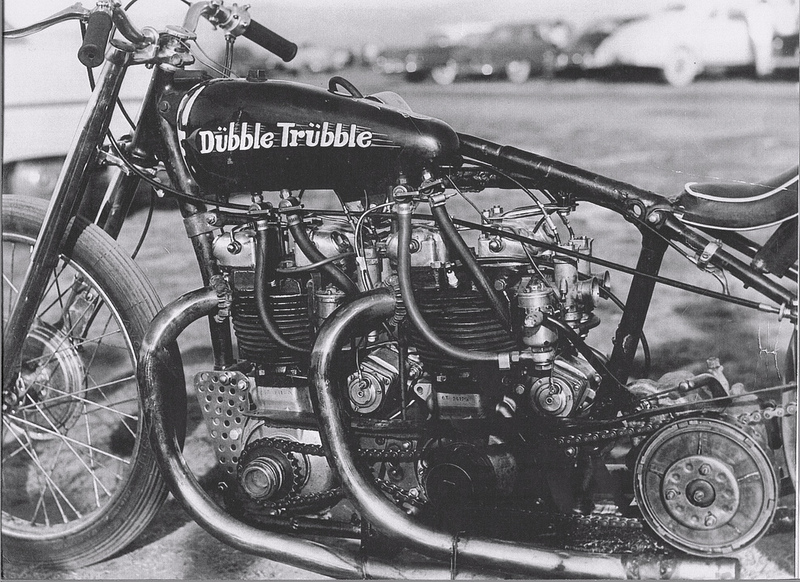 The Dubble Trubble, built in 1953 by legendary racer Bud Hare, was a beastly Triumph twin-engined motorcycle that dominated the drag strips during the 1950s with a top speed of 142.38 mph. The dual 40 cu. in. displacement engines were fed through a Harley-Davidson hand-shift gearbox with foot clutch. Only two gears are used– second and high. Totally sick. Kids– don’t try this at home. None other than Von Dutch himself painted the lettering on the legendary Triumph’s tank– which explains the 2 dots above the U’s which weren’t asked for. But then again– Von Dutch was known to kind of do his own thing. Bloody awesome and dig the pick ups door art, how cool is that? This entry was posted in Blog and tagged 1/4 mile, 1/8th mile, brat, british bike, cafe racer, chopper, classic bike, drag bike, drag racing, nhra, sprint bike, triumph, vintage motorcycle.